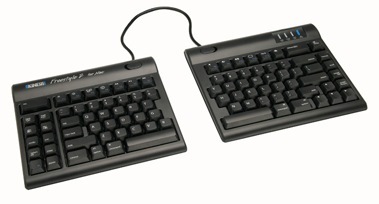 The Kinesis Freestyle2 keyboard is an ergonomic split keyboard that works flawlessly with Macs. It takes absolutely nothing more than plugging it in to set it up. If your brain and hands can wrap themselves around having a split keyboard, this one is wonderful. You have the option of using the two halves of the keyboard connected and straight, which makes it pretty much like a regular keyboard. You can also choose to pivot the two halves on a center point if that suits your style. Or if you want to go all out, as I did, you can completely separate the two halves and position them wherever is most comfortable. You are only limited by the cable that connects the two. That cable can be either 9-inches or 20-inches depending on how far apart you intend to place the sections. The style of the keyboard seems better suited to the PC world as it looks a bit inelegant next to Apple kit. But If Apple keyboards aren’t your cup of tea, the Freestyle2 can be a solid choice. The keys have a bit of an old-school feel to them reminiscent of the early IBM keyboards, but it is neither loud nor difficult to use. The USB cable seems better suited to an iMac than a MacBook Pro, as it comes off the right side of the keyboard. The Mac version of the Freestyle2 has the keys labeled as you would expect, including Control, Option, and Command keys, plus icons for Expose and Dashboard keys. There are a few extra buttons as well, that could be the clincher for many folks. On the left there are separate keys for forward/back in web browsers, cut/copy/paste, undo, select all, and moving to the beginning and end of a line of text. There are also ridges on the sides to help you locate and identify these keys. On the right side, there are home/end and page up/page down keys. These too have ridges on the side, but the opposite side, to help distinguish them. There are three optional accessory packs available: the Ascent, the V3, and the VIP3. The Ascent is a contraption that fits under the keyboard and lifts the center from a hinge on the outer edge. You can adjust the angle in 10º increments between 20º and 90º. The V3 pack is much less intimidating looking, as small lifts are placed under the central edge of each section to provide smaller (5º, 10º, and 15º) degrees of tenting. I had a chance to test out the third option, the VIP3 pack, which was essentially the V3 pack with wrist rests. The wrist rests come with pads that can be adhered to the plastic surface. I chose to use the rests without the pads and found that to be quite comfortable. I can envision that the pads, like all pads, can get damaged and dirty over time, so it’s nice to know the wrist rests are comfortable with or without them. The wrist rests demand a fair amount of desktop real estate, but they’re no bigger than others on the market. Next up I added the center lifters that provide the tenting feature. They attached solidly to the keyboard. I found them easy enough to install that I didn’t need to use the sheet of instructions, and only glanced at the stickers with directions once. The lifters provide three positions and I found all of them to be solid and easy to setup. Each position has rubber feet that keeps it non-slip. I found all three positions (5º, 10º, 15º) comfortable, but settled into the 10º as my favorite. It didn’t take long to figure out which one I preferred, but I could see how a different desk setup could change that preference. I seem always to have my shoulders hunched — hey, it’s below zero outside here in northern Minnesota! — so the Freestyle2 feels really refreshing to open up my posture and reduce the tightness that a normal keyboard can induce. While the keyboard may be good enough on its own for some setups, the accessory pack adds value for others, including mine. I got used to this keyboard quickly and liked it so much, I wish I had a novel to write!